Open Embird Editor and select Options - Measure in Millimeters. Select the Embird Studio Icon on the top toolbar. want to use. I have selected the Janome 11cm x 11cm hoop. MAKE SURE YOU SAVE THE DESIGN AS YOU GO. When you have made the changes click Save and Apply. 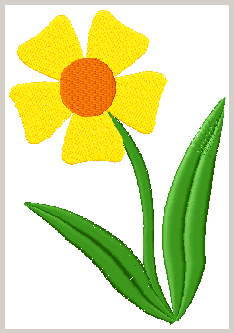 Select the flower.jpg image provided with the lesson. Answer Yes to the confirm message. 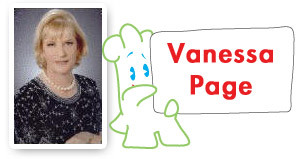 Use the magnifying glass with a right click to zoom out. Next select Image again and go to Edit image window. Make sure you have the 3rd menu selected and that 0.50 is also selected. If it isn't just left click on the square and change it on the slide bar menu. Click Apply. 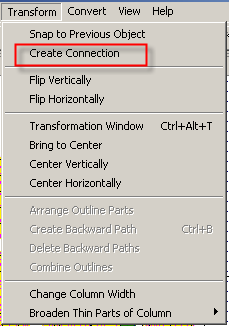 Change the settings on the column menu as follows. Starting from the top of the stalk place a node, you will notice that there are actually 2 nodes on top of each other. Move one to the right side slightly. Left click on the left side of the stalk and then left click again on the opposite side of the stalk. Continue going from one side of the stalk to the other till you get to the bottom. You can move the nodes to follow the shape of the stalk. Right click and Generate the stitches. 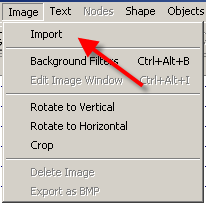 If you are having problems controlling where the nodes are going make sure the snap functions are not selected on the node menu. 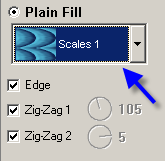 Select the Column button again and change the sample selection so that it has a line of stitches running up the center. 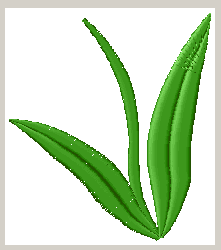 Starting from the top of the right leaf left click to place a node. Slightly separate the nodes again. Work down the leaf as you did the stalk. Right click and generate the stitches. Repeat for the other leaf only this time start at the bottom of the leaf. If you forget to change the parameters just right click select parameters from the menu and make your changes. Right click and generate to make the changes take effect. Go to the object menu and whilst holding down the control key select each of the objects we just created. Whilst they are selected drag the green colour down onto those objects to change the colour of them. Below is a 3D view of the objects. Left click around one of the flower petals. Move the circle nodes into place to give shape. On the Fill menu make the following changes. You can drag the stitch direction by holding down the left mouse button you will notice the longest line on the petal will change with the direction. Right click and generate the stitches. 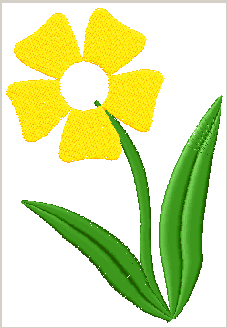 Change the colour of the petal to yellow to make it easier to see. With the petal selected select the Rotate button on the top menu. From the menu that opens select the rotate icon. 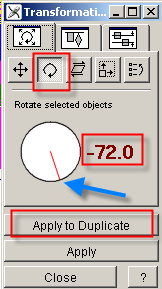 Drag the direction to -72 deg (360 deg divided by 5) if you can't drag it to the correct degrees just right click and change it that way. Apply and Duplicate. Move the menu to one side. Drag the petal into place. Hit the Apply and Duplicate again and move the next petal into place. Repeat till you have the 5 petals. 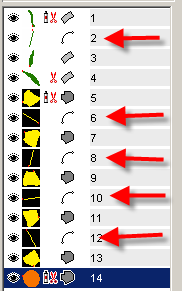 Select the petals on the object menu and right click and generate. 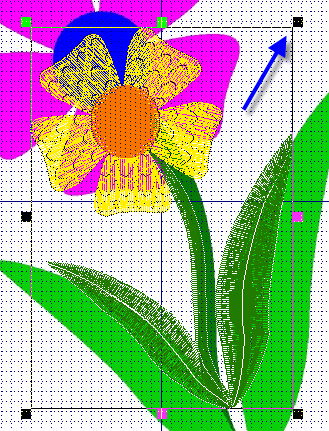 Next select the fill tool and make a circle for the center of the flower. 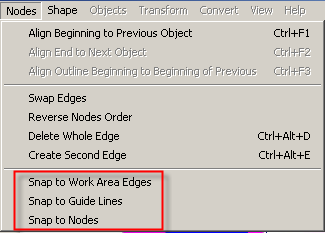 Move the nodes into place and right click to finish the object and generate the stitches. Change the color to orange. We need to add some connection stitches to cut down on jump stitches. 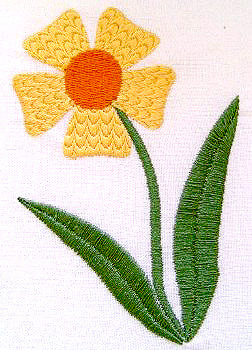 You will have a connection stitch from the bottom of the stalk to the top of the right leaf. 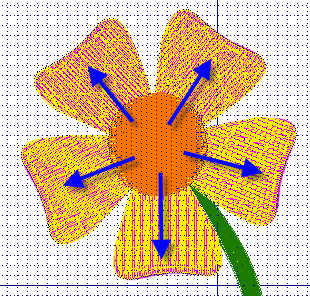 Select the second petal and repeat the process to put in a connection stitch between the first and second petals. Repeat to put connections to the other petals. Your object menu will look like mine now. and change the direction of the stitches by dragging the direction line with your mouse. Right and left clicking on the number will also change the direction. I have made the stitches go at the same angle as the petals point. You can also select the petals and change the plain fill to a fancy fill by right clicking and selecting a fill from the parameters menu. Play with these fills and see the different fill effects. Before I compile the design I am going to go to Edit – Select All and drag in the top right hand selection square and resize it down to approx 3in high. The right leaf is quite large and will tax your machine if I leave it so large. Generate the stitches after resizing.